As soon as David gets home in the afternoons Ayden is ready to play! 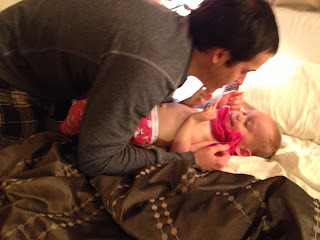 We play a lot during the day but there is something really special about playing with daddy. Today's game was Ayden chasing David around the house, pointing the remote control at him like it was some sort of laser. David was pretending to freeze, or he'd scream and run the loop of the house. He'd hide in a closet or behind a counter and would jump out saying, "Boo!" when Ayden would run by. Ayden was laughing hysterically the whole time and it was, and always is, a joy to watch their games. Bedtime is always a fun time too. David got Ayden dressed in his jammies and you bet there was tickling and more giggling involved. I sure do love these boys! They make life so wonderful. Flashback! 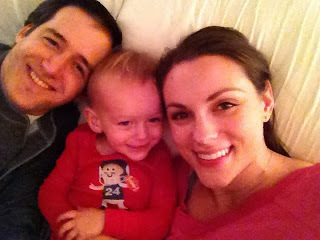 Here's what we were up to one year ago today: "Happily Healthy"
All i can say is what an EXCELLENT father and husband. Growing up my dad was always told to interact with me most times and the other dad's in my family the same. 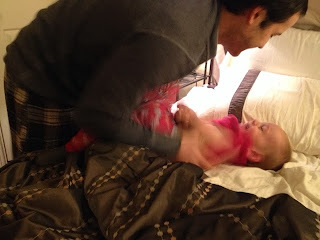 My husband is pretty awesome, however, at playing with my 7 month old. I know I need to play with my daughter more, but I blame no sleep or energy as the culprit.